For the first time, a baby born in Italy to a lesbian couple will have two mothers and no father listed on the birth certificate, despite that fact that only one of the two carried and gave birth to the child. 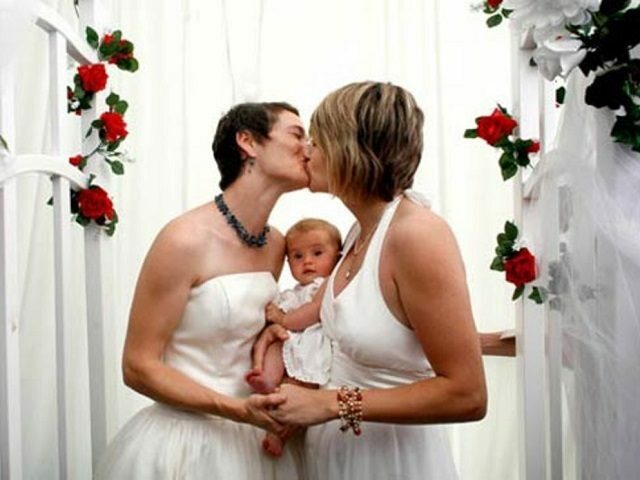 The Court of Pisa said that preventing recognition of the two mothers violates the fundamental rights of the child, who was conceived by heterologous fertilization and born in Pisa to an American woman married to an Italian woman. The Pisa court is awaiting confirmation of its ruling from the Italian Constitutional Court before proceeding with an order to reissue the child’s birth certificate with the names of the two women. The Italian woman married her American partner in Wisconsin in 2014, and later the two women returned to Italy prior to the birth of the baby. The names of both women have been withheld in news reports. The couple turned to a Danish clinic for assisted procreation, which used the sperm from an anonymous donor to fertilize an ovum of the American woman. The Italian birth certificate issued at the time carried only the name of the American birth mother who carried the child to term, noting that the baby was conceived through heterologous in vitro fertilization. After the registrar’s refusal to indicate both parents on the birth certificate, the two women appealed to the Court of Pisa. The judge also recalled that “the best interests of the child must be a primary consideration” in determining how to apply existing laws, which may mean giving precedence to the American law that allows for the recognition of both women as parents to the child. The case is now in the hands of constitutional judges who will have the final say over whether or not to accept the ruling of the Court of Pisa. Prior to Italy’s March 4 national elections, the Democratic Party (PD) pushed for the recognition of homosexual civil unions as part of its campaign platform and hung posters to this effect around major cities. The PD was trounced in the elections, falling to a record low of 18.7 percent of the vote. The party has been widely seen as ineffective in dealing with Italy’s migrant crisis and out of touch with the concerns of citizens.